The Midtown Atlanta real estate market is still moving, and we wanted to “take it’s pulse!” So let’s look at the Midtown Atlanta Market Report October 2018. First, a look at the condominium market…and a disclaimer. Midtown Atlanta is covered in two Zip Codes, 30308 and 30309. Some parts of these zip codes are not actually Midtown, but this is how we pulled these market numbers. 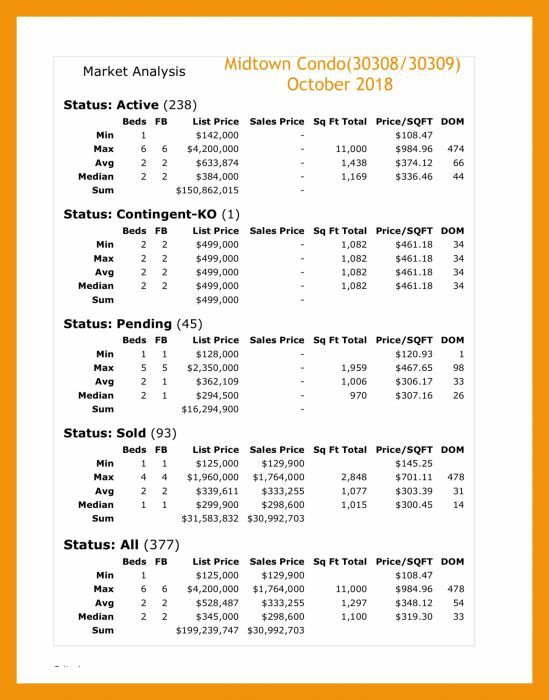 For October, there were 238 active listings, ranging from a Midtown Park 1-bedroom at $142,000 to a 3-bedroom at One Museum Place for $4.2M. In the chart below, you can see the average days on market to be 44, but the Museum Place listing seems to have been on the market for 474 days! 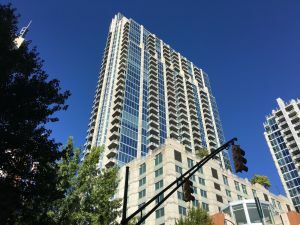 45 listings were Under Contract, and ranged from $128,000 at Renaissance Park to $2,350,000 at Residences of Park Lane in Ansley Park. 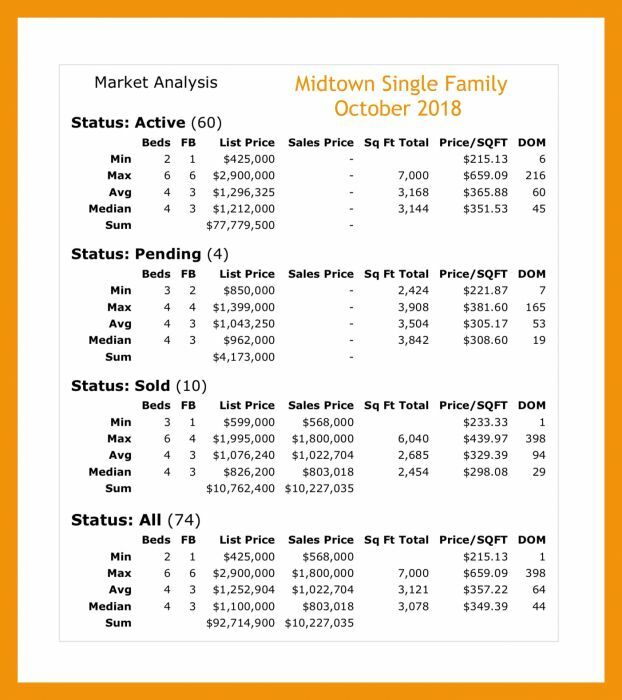 93 homes sold (or closed) in October in Midtown Atlanta. They ranged in price from $125,000 at Peachtree Battle (and example of the 30309 zip code that reaches into Brookwood outside of Midtown) to a 2-bedroom at One Museum Place at $1.764M. 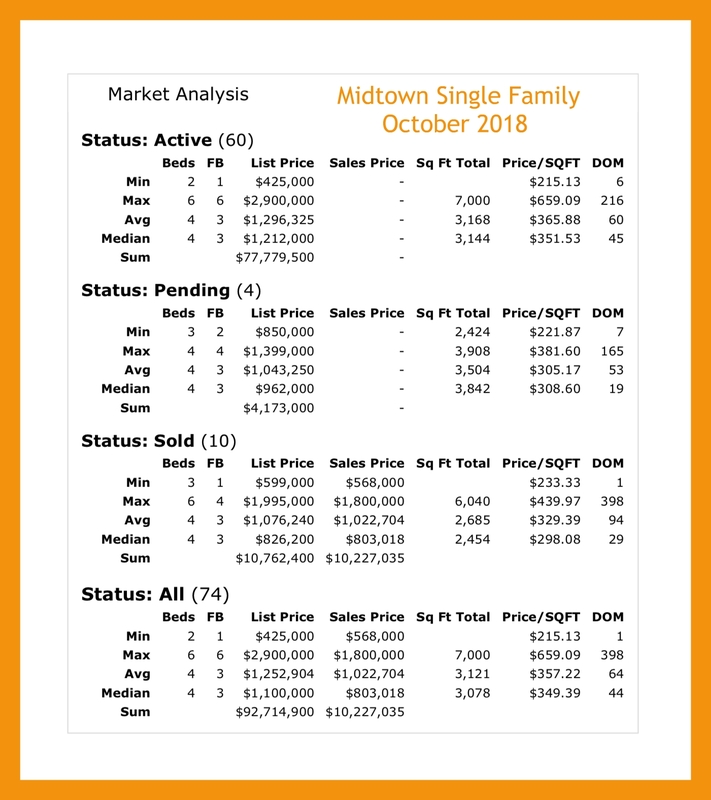 In the Single-family market in Midtown, there were 60 homes listed For Sale. (An adjustment to the chart below is $464,900 for 877 Monroe Drive to $2.9M in Ansley Park for a new construction home. There were four homes Under Contract ranging in price from $850,000 in Ardmore Park to $1.399M in Sherwood Forest. Ten homes sold in October, ranging from $568,000 in Ardmore Park to $1.8M in Ansley Park. Buying? 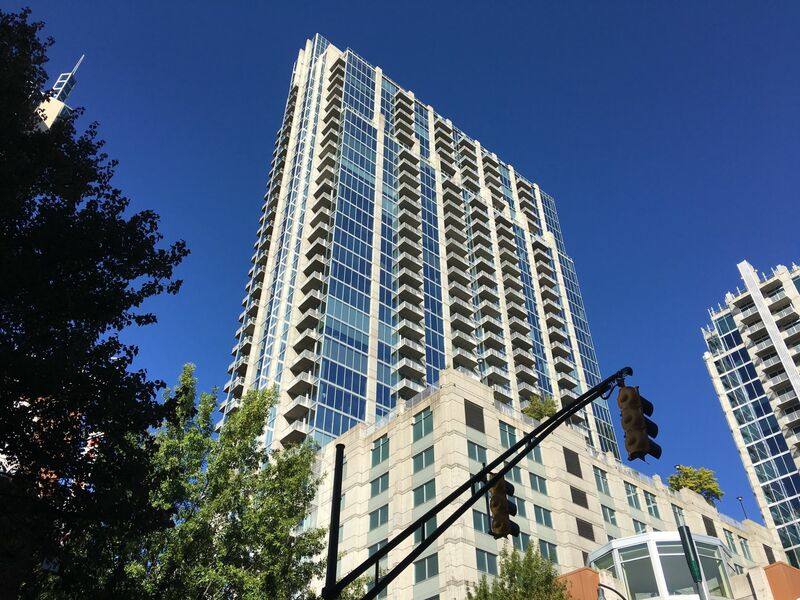 Are you looking to buy a Midtown Atlanta home or condo? We can set up specific searches for you based on price, building or other specifics you may be looking for. In a competitive Seller’s Market, we can alert you of new listings within minutes of them hitting the market! Just complete out Buyer Information Form, or let’s schedule a time to talk about what you are looking for!